True Wild Life | Chicken | The humble chicken is thought to originate from the red jungle fowl and the grey jungle fowl, found in the rainforests of India. Today, the domestic chicken is thought to be more closely related to the grey jungle fowl due to the yellow colouring of it's skin. 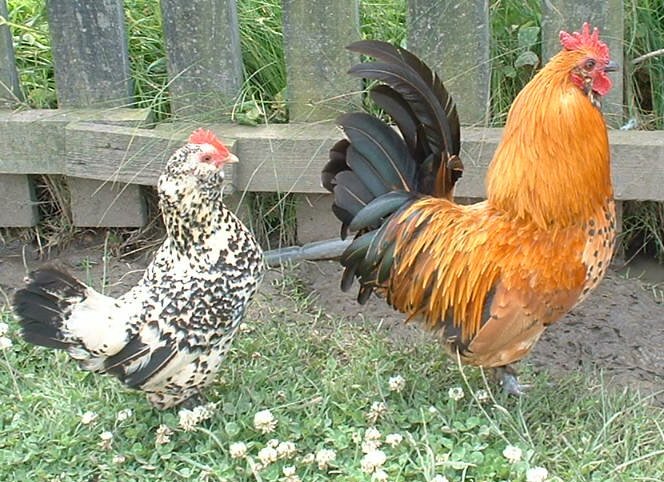 Although they are similar, the Indian jungle fowl is about half the size of a domestic chicken today. The chicken was thought to be domesticated more than 10,000 years ago where the Indians and later the Vietnamese bred chickens for meat, feathers and eggs. The domestication of chickens is thought to have then spread rapidly across Asia and into Europe and Africa resulting in the chicken being the most widely farmed animal today. There are thought to be at least 25 billion chickens worldwide, which is the highest population of any bird in the world. The chicken usually gets to about 40 cm tall and surprisingly, the chicken is one of the species of bird that is not very successful as far as flying is concerned. 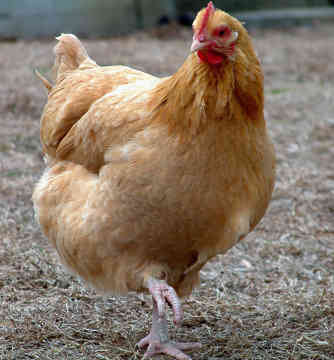 The longest recorded flight of a chicken is 13 seconds and the longest recorded distance is 301.5 feet. 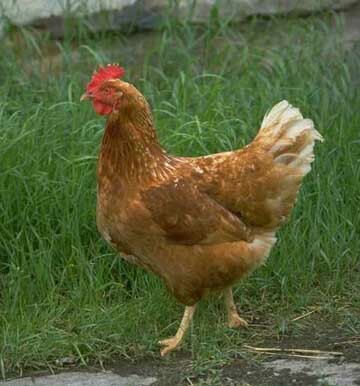 The male chicken is typically referred to as a cockerel but is known as a rooster in some countries such as Australia. 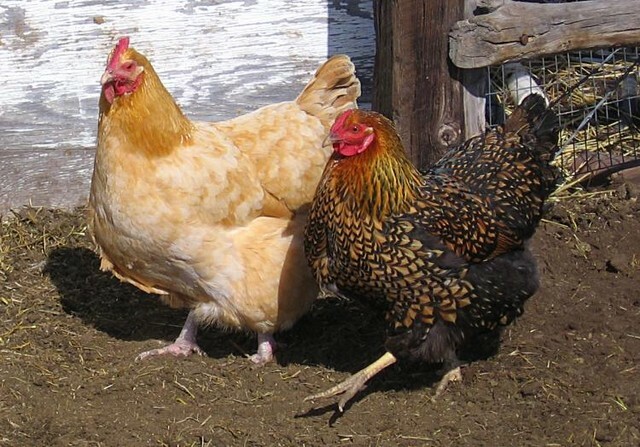 A female chicken is called a hen and the little, fluffy yellow babies are called chicks. Chickens can live for up to 4 or 5 years in the wild but many commercially farmed chickens usually do not exceed the age of one. Many chickens have been known to live for longer and the oldest recorded chicken was said to live until it was 16 years old. 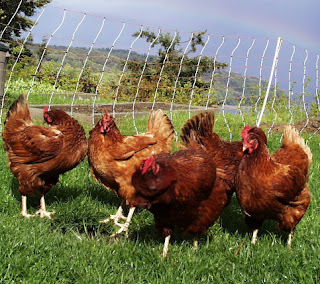 Chickens are omnivorous animals meaning that they eat a mixture of plant and animal matter. Although chickens are commonly seen scratching on the ground in search of seeds, berries and insects, chickens have also been known to eat larger animals such as lizards and even small mice. 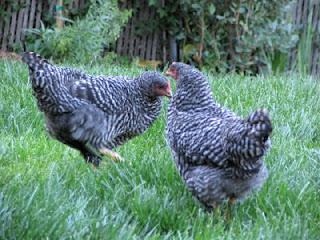 Chickens are easy prey for numerous predators including foxes, cats, dogs, raccoons, snakes and even large rats. Chicken eggs are also a very popular snack for many of these animals and are also stolen by other animals including larger birds and weasels. Chickens are kept by humans for their meat and eggs. Breeders tend to keep different types of chicken for these different purposes and meat chickens will often only reach 3 months old before they are killed, which is why it is crucial that chicken eaters ensure that the chicken they are eating has had the best existence possible in it's few months of life. The same principle applies to the egg laying chickens with the typical commercial hen laying around 300 eggs in one year. After that, the hens tend to start laying fewer eggs and are generally killed by their breeder. 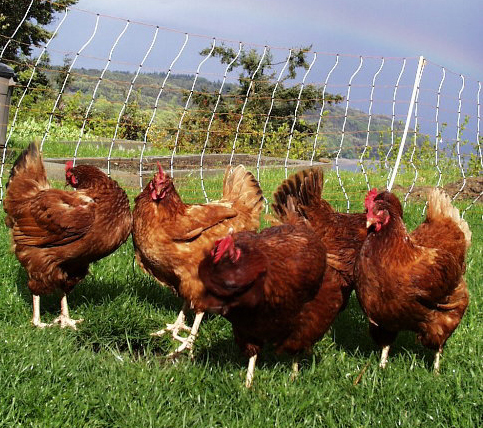 Chickens are very sociable birds and are at their happiest when surrounded by other chickens. In one chicken flock there can be any number of hens but generally only one cockerel who is the dominant male. The dominant cockerel pushes other cockerels out of their flock when they start becoming big enough to be a threat to him. The dominant male is usually the mating partner for all of the hens that he watches over. Chicken is one of the most widespread meats in the world with numerous cultures having their own special ways to prepare and eat chickens. The UK's most common dish is roast chicken, the USA's most common dish is fried chicken and in China they use every part of the chicken including their feet which are commonly found in soup. There has been a great deal of media attention focused on chickens in the last few years, mainly concerning the welfare of commercially farmed chickens. Intensive farming occurs around the world where meat chickens are force fed and packed in a shed with hundreds of thousands of other chickens often with no free space for the chickens to walk around. Egg laying chickens are shut in tiny cages and are slaughtered when they no longer produce as many eggs as they used to. The conditions that intensively farmed chickens live in are utterly disgusting, which is why chicken lovers should fork out a few extra pennies for organic or free range meat and eggs, to ensure that the chicken has had a good quality of life. great!! loads of information, its perfect thanks.